Petersfield Town has managed to stage a fightback in the second half in an FA Cup tie, and have managed to get themselves a replay at Love Lane, which they hope to win. The visitors had trouble getting to terms with the bouncy, dry pitch which seemed to be no problem at all for the home side and their unique playing style. Almondsbury was able to take the lead with just 21 minutes on the clock after Petersfield were not able to clear the ball properly during an attack. There was nobody who was tracking Jordan Rogers’ run when he made it into the box, and he then smashed a shot past Matt Shortt, the Petersfield Town goalkeeper. Petersfield was able to slowly bring themselves back into the game during the second half, and managed to score in the 72nd minute. 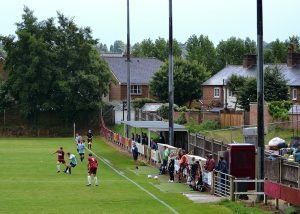 It looked like the ball was on its way out for a goal kick, but there was a player from Petersfield who managed to hook the ball all the way across the goal, and it found Josh Sheehan’s head which was able to simply put it into the empty net. Both of the sides had a chance to win the game in the dying minutes of the match. Neil Bailey, the Almondsbury defender smashed a shot from the corner and hit the crossbar, but Petersfield came back by breaking through the home teams defense and giving Callum Coker a chance to score. Unfortunately, he missed because of a last-second tackle which prevented him from getting a shot in. Just a few moments after this, Coker tried and failed once more when he was given a one-on-one opportunity to score, but only managed to chip the ball into the hands of the keeper. Maybe he will do better in the future.